Click on the Audible or iTunes links to the right to purchase the fully functional audiobook, with true audiobook capabilities such as resume and bookmarking. You can also listen on your devices using the iTunes and Audible apps. This essay will change the way you think about patents and copyrights. Few essays written in the last decades have caused so much fundamental rethinking. It is essential that libertarians get this issue right and understand the arguments on all sides. Kinsella's piece here is masterful in making a case against IP that turns out to be more rigorous and thorough than any written on the left, right, or anything in between. Would a libertarian society recognize patents as legitimate? What about copyright? In Against Intellectual Property, Stephan Kinsella, a patent attorney of many years’ experience, offers his response to these questions. 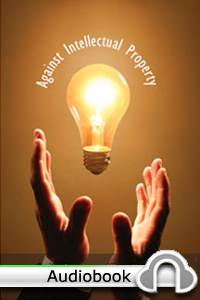 Kinsella is altogether opposed to intellectual property, and he explains his position in this brief but wide-ranging book.